Abbey Rapids is a short section of the River Tees between Barnard Castle and Whorlton Lido, by Eggleston Abbey, just upstream from the bridge. It is a well used section of the Tees that, depending on water level, can provide challenges for the best paddlers in the country. Whether you are a white water paddler, a slalom or white water racer, the Tees offers challenges for all abilities. In low water the rapid represents a simple challenge as the water trickles down the gorge towards the bridge, creating water that event division 3 and 4 paddlers can master. 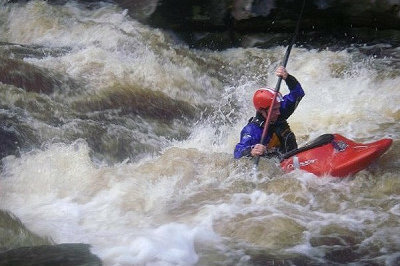 At higher levels, the water becomes incredibly powerful and can challenge the most experienced of paddlers, particularly as the water drops deeper into the gorge, just above the road bridge. 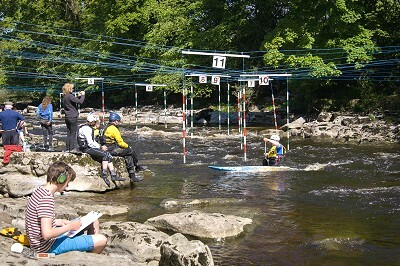 Abbey Rapids has been used for many years as a training venue by many clubs and groups. Over the past few years Tees Tigers have maintained the slalom gates and erected the course at the beginning of the winter. The site has access throughout the winter (from October through to March) along with during the summer months, only when the river is in flood. To find the site, the easiest route is from the A66. from the east, take the first turning signed for Barnard Castle, this road doesn't have a road number, but is signed. When you get to the traffic lights, the event camping is on the left, you really can't miss it. From the west, pass the first turning for Barnard Castle (B6277) and take the next. This road doesn't have a road number, but is signed to Barnard Castle.When you get to the traffic lights, the event camping is on the left, you really can't miss it.